“You know the Scandinavian monarchies? Think of it like that. We want a minimalist relationship with Europe. Think Danish Furniture. It’s like a mug of jelly. A seal biscuit. Some old mince. We want an octopus Europe. A daring pad of A4. A biro with four different colours. Small beer in small bottles. Facts about sharks. A cup of tea Europe with 15% milk. A gluestick with the lid left on. Lovingly restored cobbles. Flakey pastry around the edge. Not a pinstripe Europe, bur rather a gingham check with paisley lapels. Plastic daffodils pinned to the edge. Goats cheese optional. Those artificial ice cubes that they put round fish in a mid-range supermarket. That’s my kind of Europe. But with plastic lobsters too. A holidays in the sun Europe, a duty free Europe, no gallic shrugs of misleading salami, a pizza oven Europe stacked with fruits de mer. A zen Europe, a shiatsu Europe, a bring-your-own-mat hot yoga Europe, a free newspapers on the train Europe, tennis shoes, wood panelling, James Dean posters. A warm gun Europe. E-cigarettes. Minatures of schnapps. Rustic bottle openers. Screw human rights; I’m browsing the postcard shelf. You know, a no corkage Europe. Optional side salad. The very best of the Rolling Stones 5 CD set. Smearing factor 30 on your iPod. House double Europe. Sniffing cocaine with a violin virtuoso Europe. An acoustic Europe. One gold star and the deep blue sea. Wickerwork donkey figurines spattered in bull’s blood. 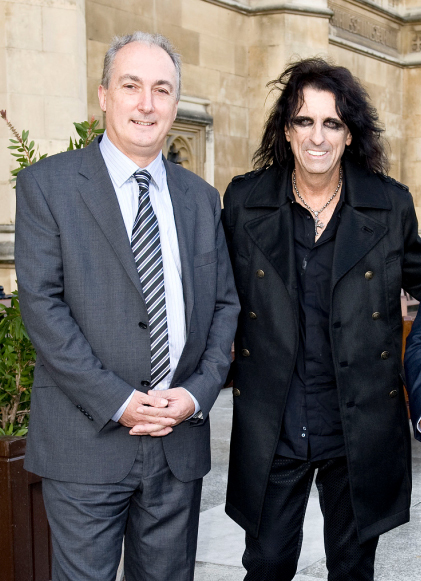 Mike “hanging out with Alice Cooper”. We’re not worthy. What he doesn’t mention is that as well as voting in favour of a referendum, he also, um, voted against. Here’s the full list of names from Hansard. This is known as “active abstaining”, showing that he bothered to show up in the House of Commons, but cancelled out his own vote by scuttling through both lobbies. So presumably alongside his letter to the Prime Minister demanding a referendum, he’s also sent him a text saying that actually he wouldn’t mind if there wasn’t one after all. His blog claims “At the last general election I promised to support a referendum.” Surely there are more forceful ways of keeping your promise to the good people of Hove than, um, not actually voting for a referendum? At the time of the last referendum vote, his staff of “terrifying neo-cons” were all of a twitter about how the People’s Mike was going to stick two fingers up at those pesky Europeans. Sadly, it looks like he could only muster one and a half.